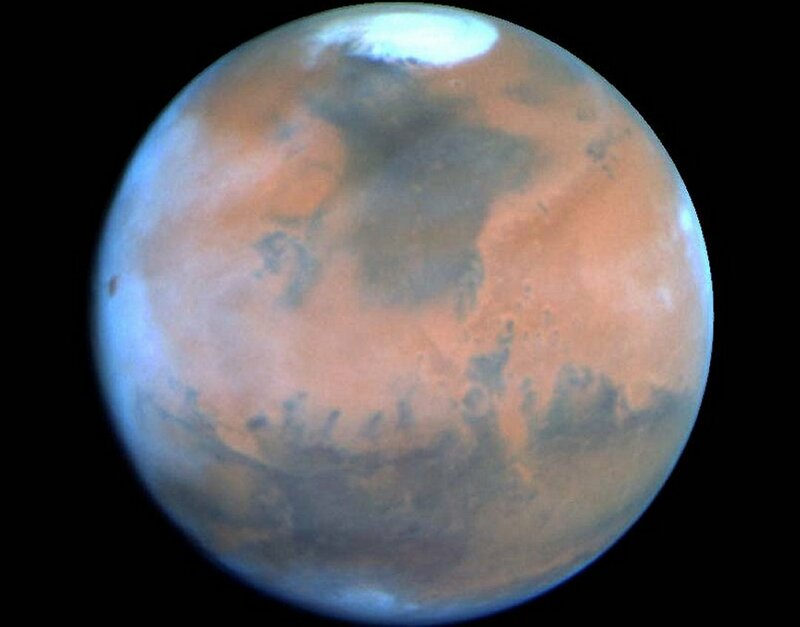 Are Mars and Barsoom the same world? 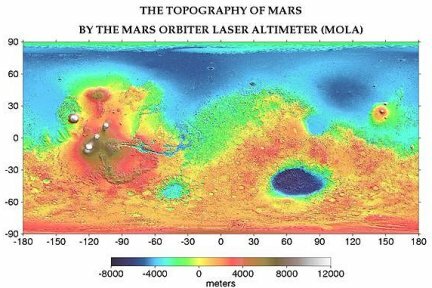 Or more interestingly, can we find the traces of Barsoom in the Mars we know? This has been the subject of a series of essays, I've titled “Matching Mars” or the Geographers of Barsoom. 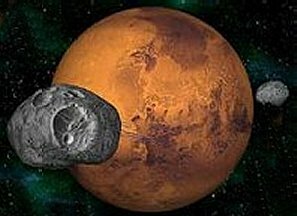 Geographers of Mars I: Matching Mars and Barsoom, A New Approach -- the first of these essays, in order, chronicles the history of Primeval Mars, the mighty impacts that shaped that world, its resulting strangely lopsided geography, the formation of its mountains and volcanoes and the evidence for oceans and seas. 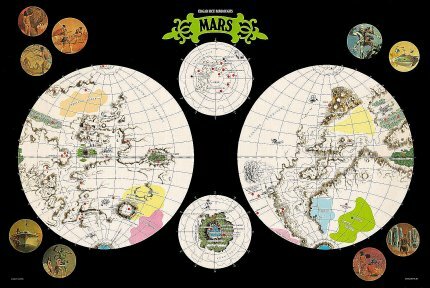 Geographers of Mars II: The Difficulties of Non-Natural Landmarks -- the second essay, then proceeds to look at the geography of Burroughs Barsoom, and begins to match it against the Mars we know, not by trying, initially to find the living and dead cities. But rather we link discernible geographic features, like the Toonolian Marshes, the Gathol Seamount, the snow clad Artolian Hills, the former Gulf of Torquas and the Torquas Mountains, the Otz Mountains, Valley Dor and Sea of Korus, to documented Martian geographic features, such as Valles Marinis, Elysium, the Tharsis volcanoes, Hellas and Argyre. This then, should be the third in the series (having written them completely out of order), which pays particular attention to the polar regions. The fourth, and final, has us using the established matches in geographical features as references to determine or extrapolate the locations of the living and dead cities of Barsoom. But why should we pay particular attention to the polar regions? Because they pose a unique problem. Unlike say the Toonolian Marshes or Gathol, we do not have to search for the poles. We know exactly where they are. On the other hand, Burroughs depictions of the poles show us strange regions, and thus, we need further explanation to understand why and how Barsoom's poles have their peculiar features. 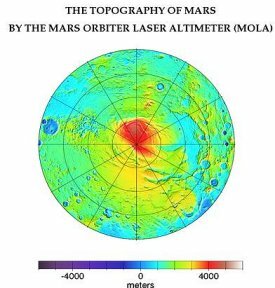 If we look at either a map of Barsoom's south pole, or a topographical map of the Martian South Pole, we see a kind of lopsided sort of half moon bulge. Beneath that bulge is one of the wonders of Barsoom, a buried sea, called Omean. Oddly enough, this bulge is not too dissimilar from at least some fan-based maps depicting Omean's outlines at the South pole. What is this unusual structure and how did it develop? Omean is tied into the early history of Mars, as we shall see. Approximately 3.9 billion years ago, Mars had a relatively small south pole composed mainly of water ice. Then disaster struck in the form of the Argyre and Hellas impacts in the southern Hemisphere. Argyre produced a crater 1100 miles wide four miles deep. Hellas Crater spanned 1400 miles wide and 2500 miles deep. Both impacts displaced huge quantities of material. Hellas was surrounded by a thousand mile ring of debris up to a mile high. The falling debris crossed the northern hemisphere creating the Syrtis region. It is estimated that the debris raised by Hellas would have covered an area the size of the continental united states to a depth of two miles. We can assume that the Argyre impact was only a little smaller, one half to two thirds the impact. In which case, we can easily imagine another mile of debris covering the United States. Of course, in both cases, some of this debris wound up at the poles, and the planet's orbital mechanics and weather patterns would concentrate it there. As debris moved up towards the equator, the planet's turning would cause it to spread and thin. As it moved towards the pole, the planet's rotation would tend to concentrate it in a spiral pattern. And so, Mars ancient south polar ice was covered with a rain of hot rock from Argyre. The impact of the heated molten rock on the ice caused massive instant melting, cooling the rock surfaces, and literally welding them into a granite cap. The South pole ice cap was covered in thin layer of volatile water beneath a layer of rock a half mile or mile thick. This was followed afterwards by the Hellas impact, which deposited a mile or more of debris. This impact hardened and condensed the Argyre layer, transforming it into a rigid dome. Meanwhile, the ice beneath the polar cap began to melt, transformed by geological heat and the accumulating stress of coriolis forces. The melted moving water ate away at its rock shell, dissolving volatiles and lighter elements, including hydrocarbons from the impact. The soluble materials remained suspended for a time but eventually chemically reacted and formed a thin limestone shell all around the sea. The heavier particles eventually sank to the bottom and congealed in the currents, forming islands and structure. As a result of water movement within the shell, the upper shell was eaten away, and the lower floor sank. Thus, as the volume increased, air emerged in the upper reaches. Trapped sea's upper levels were filled with gas, mostly hydrogen, oxygen, carbon dioxides and nitrogen. Of course, the structure of the buried sea was might well be unstable, and likely, some sections quite possibly did collapse inward. Nevertheless, the overall geology had produced a unique arched dome, an immense hollow structure filled with water. The only comparable features on earth would be the immense underground reservoirs of oil and natural gas. A structural flaw, hydrogen and volatiles eating away at a pocket, eventually produced a hole, an apparently volcanic appearing crater, over two miles wide. The pressurized sea erupted out, in a brief geyser, shaping the crater. The external and internal atmospheres mixed, and Omen's volatile chemistry stabilized. The buried sea's level was reduced, though the kilometers deep exit wound up trapping most of the water vapour. Islands formed or rose above the surface. It is likely that this sea was lifeless. During the period of its formation, there was likely no life on Mars. Or if there was, it was likely no more complex than bacteria. If Bacteria did exist, then we could imagine bacterial colonies, strange arrays of microscopic organisms, living and dying in the bizarre soup of melted water, hydrocarbon and minerals that formed this sea. It might even be possible to imagine more complex creatures, fish or sea slugs, inhabiting this buried ocean, leftovers or developments of a Mars unspeakably ancient. But it is more likely that any living species of sea life, including fish, were probably introduced into this sea by human colonists. Welcome to Omean, the buried sea, the last sanctuary of the First Born, and one of the last great bodies of liquid water on the planet. 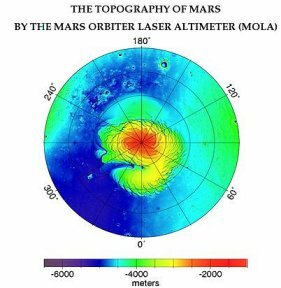 Look at the topographic map of the Martian North pole, and we see the polar cap as a beautiful spiral starfish, trailing a large arm. Look a little closer, and you can see, fainter, with lower elevation and broader contours but still recognizably there, a second trailing spiral arm, smaller, fainter, less well defined but nevertheless present, which makes the north pole ice cap resemble a swirling spiral galaxy. This is the home of two Barsoomian cultures. Okar, located within the elbow of the large white spiral arm, and Pankar, hidden within the fold of the lower, broader, smaller and less defined spiral arm. Near Okar is also the site of the Barsoomian carrion caves. To appreciate what this place is, and how it is shaped, we must turn the page back, and consider again the history of primeval Mars. Like the rest of the world, the north pole owes its strange shape to the twin impacts of three to four billion years ago. The effects of Argyre and Hellas on the North pole were, in their own ways, nearly as dramatic. The North pole, of course, received only a fraction of the debris which fell at the south pole. This arose simply because of distance. The south pole was five or six times closer to the impact sites than the north pole, and more, the north pole was well around the curve of the planet. Nevertheless, the north polar region, like the south polar region, tended to build up and concentrate its debris. The rotation which thinned debris out on the equator also thickened it as latitude increased, and created islands of debris at the pole. The contribution of Argyre to the north pole was fairly minimal. The contribution of Hellas somewhat more substantial. However, unlike the South pole which was buried under miles of welded rock, the North pole's debris cover was hardly as thick, instead of two miles, it was perhaps only a few hundred yards. It was much finer and lighter, because of the distance travelled, than the heavy rocks which bombarded the south pole, it tended to include more light volatile chemicals, and the debris tended to concentrate in spiral patterns, matching the pattern of rotation and further shaped by coriolis winds. So, instead of being buried, the north pole continued as a geographically and geologically distinct region. The ice cap continued to swell and expand. Now, however, the distribution of heat absorbing rocks and volatiles guided that expansion and contraction. The result was the two great spiral arms, representing Hellas and Argyre, and the overall radiating spiral structure. The deposited debris mingled with ice, surrounding it and melting it, while at the same time being shaped by the pressure of ice above and around. On the Okar arm, melting water beneath the congealing and solidifying debris sculpted bizarre rocky lands and formed extensive cavern complexes at the edge of the pole's outer rim. Leftover sulfides and hydrocarbons gave the caverns their unique smell and likely fed a strange hothouse ecology, which eventually resulted in their being named the Carrion Caves. The Okar arm, as of the vast fall of Hellas debris on that side, became a territory of impenetrable granite cliffs, surrounded on both sides by huge towering glacial masses. Within the shelter of the Okar arm, the landscape became giant valley dozens or hundreds of miles in length, tapering in towards the pole, with a floor covered by a mixture of rock, dust, volatiles, ice and snow. It was mineral rich, stable territory, sufficient to support cities. According to legend, the fleeing Okar people, retreating northward, discovered the Carrion Caves and built their cities. However, the legend is likely not completely accurate. It seems impossible that a fleeing refugee population, with only the clothes on their back, could survive in this wasteland long enough to build working shelters, much less a dome city. Even if the refugee population was able to find energy in the buried hydrocarbons, perhaps trapped methane or natural gas, they should have quickly starved to death. It is more likely that the Okar region was already discovered, and there was some rudimentary city or cities and towns already established which could absorb the massive influx of refugees. Indeed, the similarities in technology between the Okar and Pankar domes are suggestive. There's no indication that these societies have any contact with or knowledge of each other. Their similar technology could have been independently arrived at, in response to the harsh conditions. Or they may both have their ultimate origins in bases established and technologies pioneered during the period of decline before catastrophic collapse. The Okar society was completely cut off from the rest of Barsoom, which is why we place it in the shelter of the high arm, and the likely heavier debris flow from Hellas. The debris flow on the opposite side of the pole from the Argyre and Hellas impacts was much less intense and more diffuse. The result was a much less distinct spiral ice arm, and a much broader field. The debris flow also joined fairly continuously with the surrounding Martian landscape, leading to a gradual transition, rather than fierce rocky cliffs. Without the heavy concentration, the shadow or sheltered area with this spiral ice arm was not cut off and isolated from the rest of the Martian world. The broad, relatively flat and stable ice and snow fields around this arm became the perfect storing grounds for Hin Abtol's army of frozen warriors. And there we have the strange contours of the north pole explained, both for Modern Mars, and for Barsoom's cultures. For those who are imaginative, however, a look at the Martian north pole shows a couple of other features which might inspire speculation and wonder. There is a third small inlet into the pole, just past the great Okar inlet. This one is wider and less deep, but potentially hides another lost Barsoomian nation. And if we follow the great Okar inlet further, we see beyond its end, a small blue dot, an isolated and trapped oasis, surrounded on all sides by towering cliffs. Is it inhabited? Of course, we can only take these as tantalizing suggestions of geography. Burroughs was silent on the matter, leaving us only with the strange polar civilizations of Okar and Pankar. Let us be content that we can look at the map of Mars and find them.